OKUJUN is made up of two collections: SUPREME YUKI SILK, a fabric of highest quality that is produced by a method descended from the traditional technique of making Yuki-tsumugi fabric (a technique that was inscribed on UNESCO’s Representative List of the Intangible Cultural Heritage of Humanity in 2010); and YUKI SILK, a new fabric that preserves the same fine texture but is made by using a more efficient production process. In each of these two lines of silk fabric, more than 40 production processes are employed to create the warmth of the handiwork, as well as a beautiful luster, extraordinary lightness, and rich texture. We hope that you will indulge in experiencing the utmost luxuriousness of this comfortable fabric. Our original fabric has carefully been hand crafted through 40 different small processes. “Yuki-tsumugi, Silk fabric production technique” listed by UNESCO as Intangible Cultural Heritage. The secret of the soothing texture lies in the yarn, which is tenderly hand-spun from floss silk obtained by softening the cocoon and spreading it out by hand. The texture of the finest quality Yuki-tsumugi is the product of many master artisans’ extraordinary handiwork. Because Yuki-tsumugi production is specialized, it requires the sophisticated coordination of professional instinct and dexterous artistry nurtured through long, dedicated practice. A single piece of cloth is born through the hands of many such master artisans. 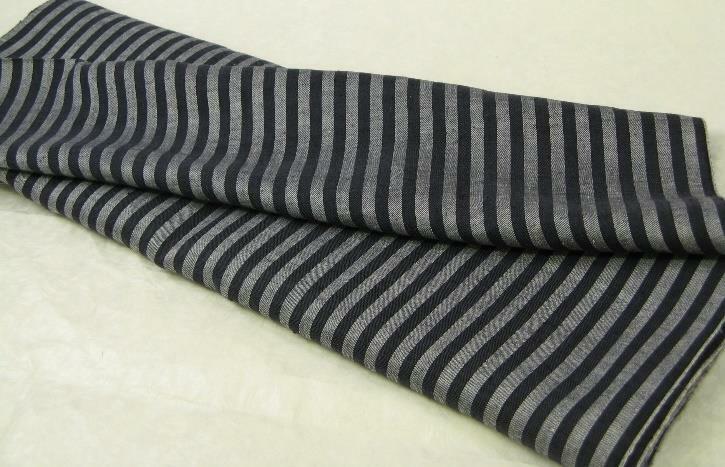 In contrast to the original Yuki-tsumugi fabric, which is used to create kimonos and is made only in a width of 37 cm, SUPREME YUKI SILK is made in widths of 37 and 75 cm. Yarn is spun by pulling floss silk with the fingertips. This hand yarn-spinning process yields a rich texture that can be produced only by the human hand. The spinning of yarn from floss silk by hand is an extremely rare technique that is globally unique. Two methods are available for creating a kasuri, or splashed, pattern: one is kasuri kukuri, in which the part of the yarn that is to form a pattern when completed is covered with hand-tied thread to avoid its being dyed in the next process, and the other is a direct dyeing method in which color is directly rubbed on to the yarn with a spatula. A traditional back-tension loom called a jibata is used to weave the hand-spun yarn into cloth while minimal tension is applied to the yarn. The warp is tied to the weaver’s hip; this makes it inseparable from the loom and enables the weaver to control the tension of the warp through movements of the hip while weaving. 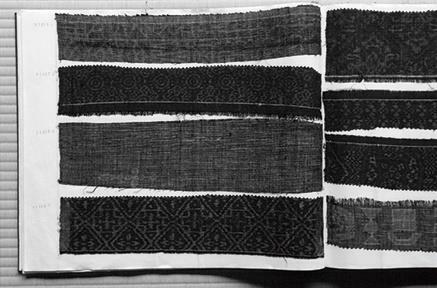 These days, jibata weaving is rare and is used by only a few production sites in Japan. There is also another type of weaving, called takahata, which is done by hand using a foot-treadle loom. Some takahata looms have been adjusted to accommodate the weaving of broad fabrics. In the pursuit of finer textures and better functionality of clothing fabrics, new textures and fabric expressions were created through many test weavings using evolved and sophisticated techniques. While preserving the essence of the master artisans’ handiwork, improvements have been made in the efficiency of the processes by which floss silk is pulled to create yarn, and in weaving. These improvements have led to the evolution of the new techniques used to produce YUKI SILK. A fabric that is 150 cm wide has also been successfully developed through an open and flexible approach to new techniques. Yarn is spun from floss silk by hand with the help of a power-driven tool. When floss silk is to be used as the warp, a fine raw-silk yarn is intertwined with it to strengthen the yarn. When it is to be used as a clothing fabric or used with new materials, the thickness and feel of the yarn are adjusted accordingly. In addition to kasuri kukuri, in which the part of the yarn that is to form a pattern when completed is covered with hand-tied thread, and a direct dyeing method, in which color is directly rubbed on to the yarn, other methods are employed, including a method by which pattern papers are placed on the warp and the pattern is printed on the warp by hand. These kasuri pattern-making techniques are used to create highly refined and expressive patterns. Weaving is done with a tool that is half power-driven. For this, techniques different from those needed for the work done solely by hand are required. Additionally, weaving a kasuri pattern into the fabric requires endurance on behalf of the weaver to match the yarn, one string at a time, to create the pattern. New textures and techniques are continually being developed. 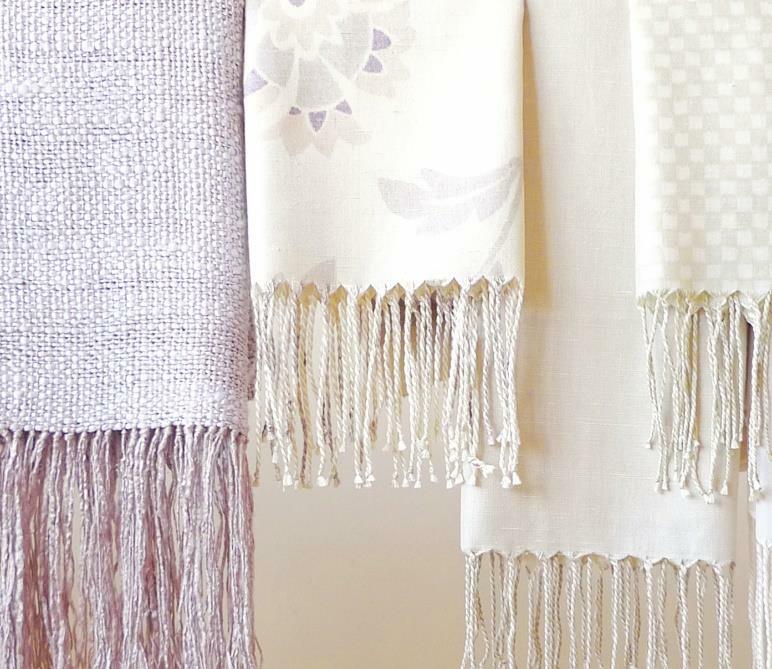 For example, in recent years, fabrics with a much finer texture have been produced by changing the weaving density; moreover, thick floss-silk yarn is now being woven by hand on a takahata loom, and broad fabrics are being woven successfully. The Yuki region, where Yuki-tsumugi has been nurtured, is located in the middle of the Kanto Plain. It is a fertile region along the Kinu River and a production center for woven silk fabrics that has a long history of sericulture. The original Yuki region extended over the present-day Ibaraki and Tochigi prefectures and was centered on the city of Yuki, in Ibaraki Prefecture. 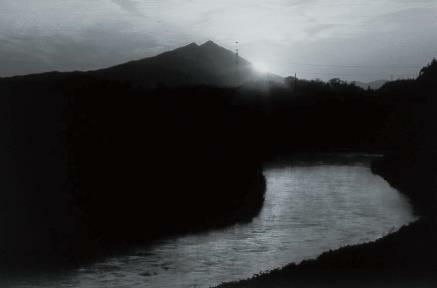 Archetype of Yuki-tsumugi called Ashiginu was woven. From the early 17th century to the mid-19th century, (under the Tokugawa regime 1603~1868) Yuki-tsumugi was regarded as the finest of the all textile in Japan. First Ikat pattern was woven. 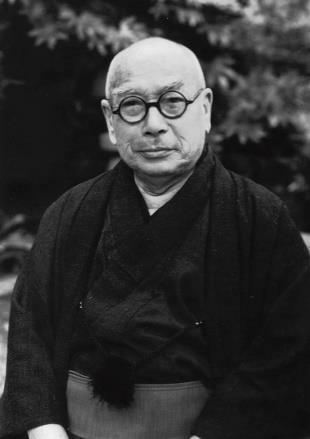 Yuki was originally worn by gentlemen of Samurai and Merchant classes. The fabric was woven either plain or in a stripe pattern. Since then more ladies began to wear Yuki. The three core production processes were designated as part of the Important Intangible Cultural Property of Japan in 1956. 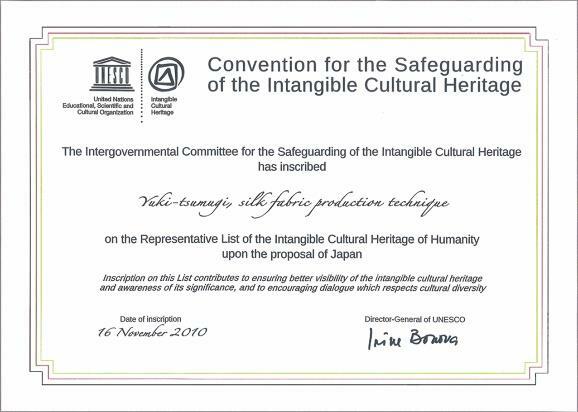 The unique production process was listed by UNESCO as Intangible Cultural Heritage. 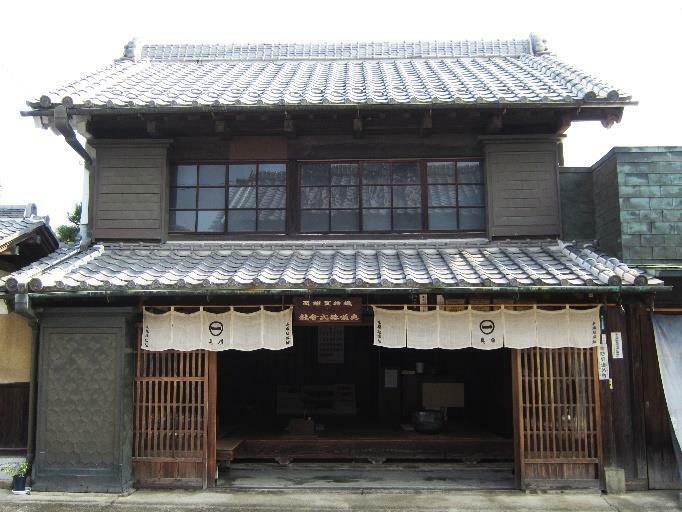 Okujun was established as Kimono maker and wholesaler and cultivated its reputation throughout a century mainly among domestic Kimono Industry. 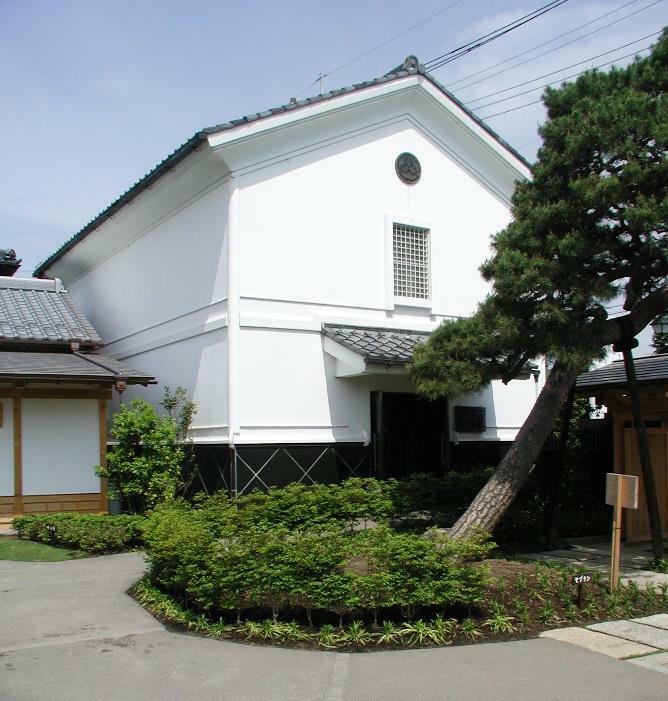 Textile museum ; Teori was established. 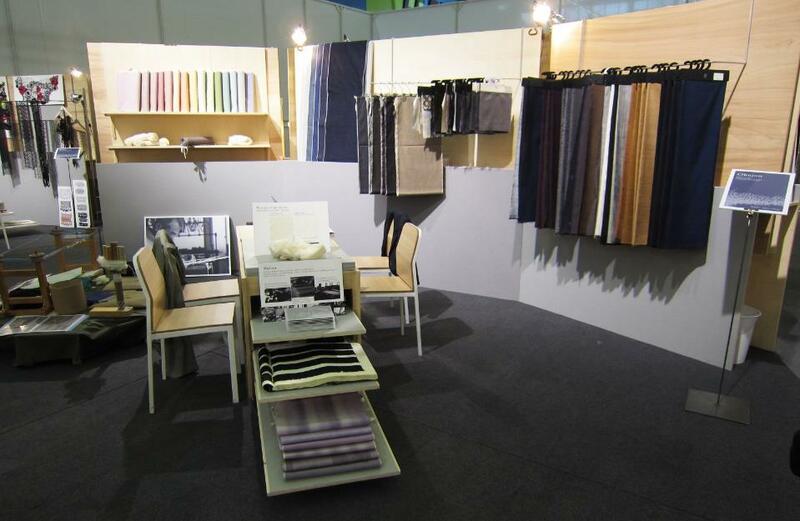 Okujun put high priority in fabric development for the garment to accommodate fashion industry. Museum, shop and workshop facilities opened as 100th anniversary project. Own fashion accessories brand called “YUKI OKUJUN” was launched. Since then, we have released original products each year, working closely with fashion brands and holding special exhibitions at Japanese department stores and selected shops. 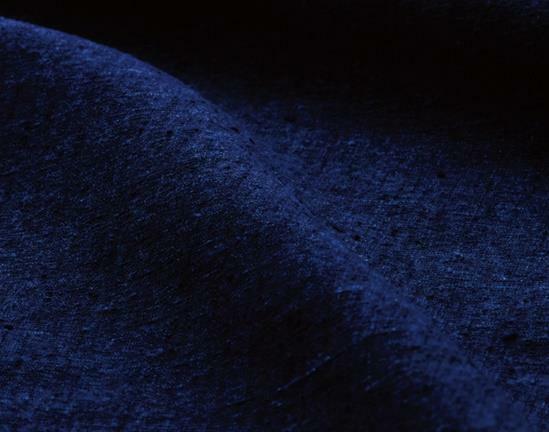 Development and Improvement of fabric specifications for the high end garment fabric. 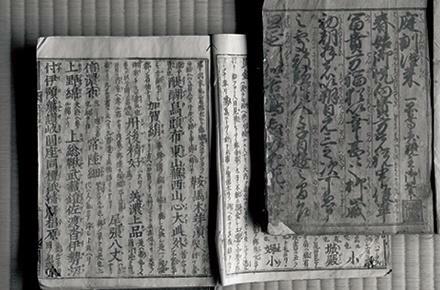 Okujun was invited to participate to the 1st edition of Maison d’Exceptions (Premiere Vision). Okujun textiles captured the eye of a European luxury fashion brand and were used to make an evening suit that was included in the brand’s presentation at Paris Fashion Week. Since then, Okujun has begun to work cooperatively with luxury fashion brands on their collections and is collaborating with ateliers in Paris. Okujun is participating to the 2nd edition of Maison d’Exceptions (Premiere Vision). 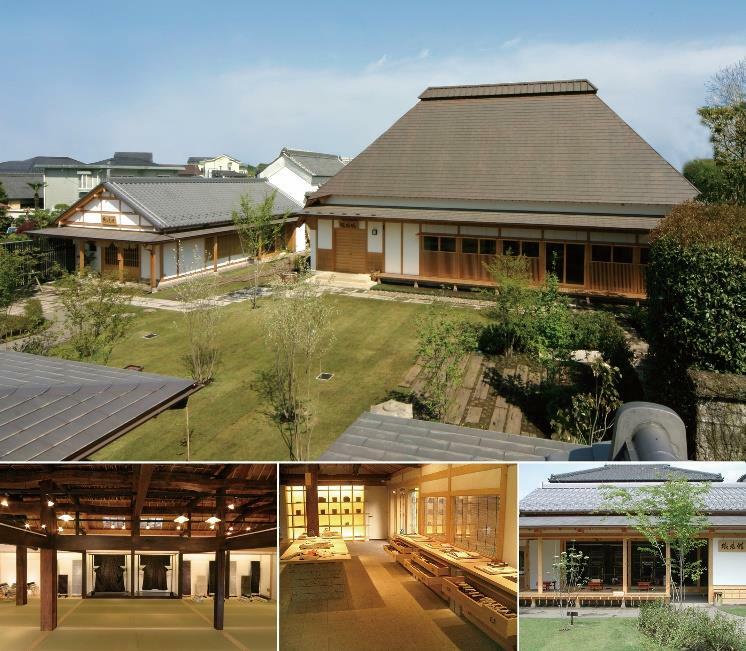 Okujun was again invited to participate in 2014 and 2015 and was well received. 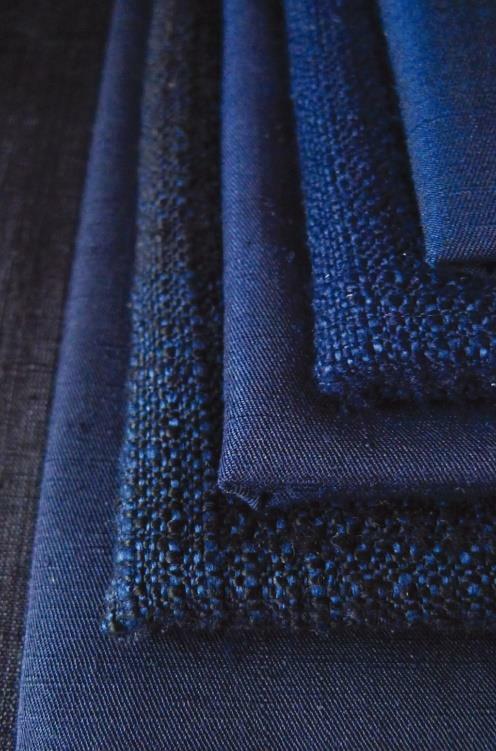 Okujun textiles began to be introduced as high-end fabrics for tailor-made clothing used by high-class tailors and department stores in Japan. 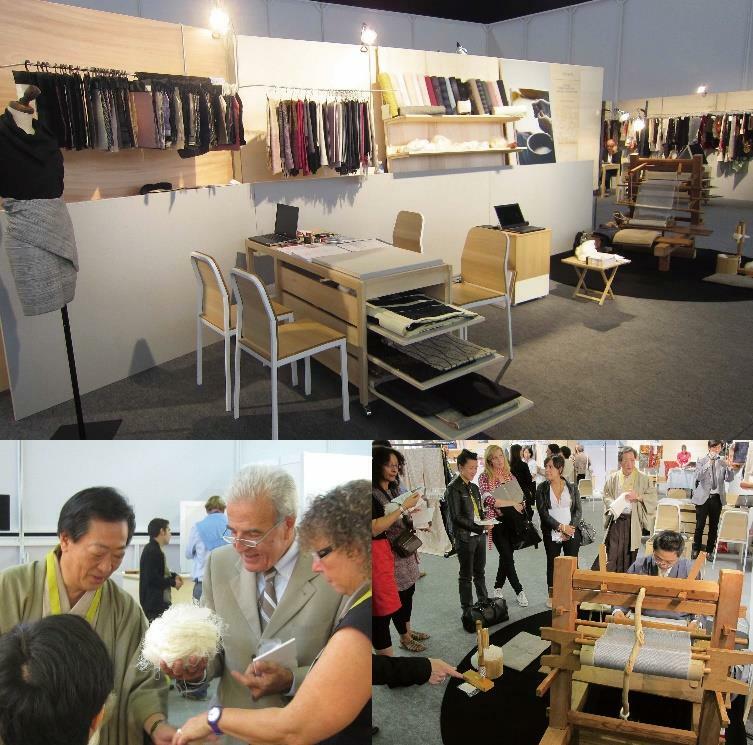 With the further development of new textiles and products came the expansion of our efforts both in Japan and overseas. ©2014 奥順株式会社 All rights reserved.